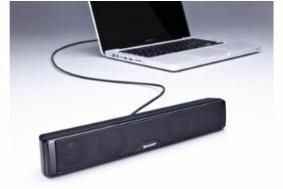 Sharp launches USB-powered 'Sound Bar' laptop speaker | What Hi-Fi? This '2.1-channel' speaker connects and charges via your computer's USB connection, delivering 2.2 watts of power. It's compact and portable and naturally aims to improve on the generally poor sound quality of the average laptop speakers. The Sound Bar design makes the CP-USB50 slim, lightweight and portable, even coming with a carry bag for lugging the unit around. Measuring just 26cms wide and 4cms tall, the Mini Sound Bar comes in a high gloss finish and costs £40.